Posted on 22/02/2017 at 10:35 am. West Jerusalem municipality bulldozer demolishing a Palestinian home in Beit Hanina. 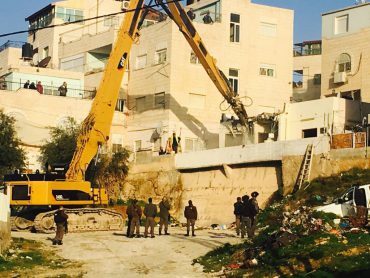 JERUSALEM, February 22, 2017 (WAFA) – Bulldozers of the Israeli municipality of West Jerusalem Wednesday demolished a Palestinian-owned building in Beit Hanina, an Arab neighborhood in occupied East Jerusalem, local sources said. The municipality claimed the building, owned by Lu’ay Abu Romouz, was built without a permit. Israeli police sealed off the area before and during the demolition to prevent people from reaching it, said the sources. Home demolitions in East Jerusalem have surged since the beginning of this year with the right wing municipality vowing to demolish all Palestinian buildings built without permit. Two weeks ago, Israeli bulldozers demolished two Palestinian-owned buildings in Beit Hanina under the same pretext. One of them was still under construction. While Palestinians in Jerusalem say they are forced to build structures and buildings without a permit as the Israeli municipality doesn’t issue permits for them, Jewish settlers are regularly given the approval of constructing more housing units in Jewish-only settlements.